Above: The Grimshawe’s Catholic chapel was housed in the top floor turret at Errwood Hall. A light kept burning throughout the night was said to be visible throughout the valley. Above: Click to enlarge the press clipping. My thanks to Mike for sending this snippet he discovered about Samuel Grimshawe, who inherited Errwood Hall following the death of his father (also called Samuel), in 1851. Sir, In the visitors’ book, at Lime Hall, is written “The Bishop of Shrewsbury,” and also Samuel Grimshaw. I would respectfully desire to ask, is this the pretended Romish Bishop of Shrewsury’s own writing? 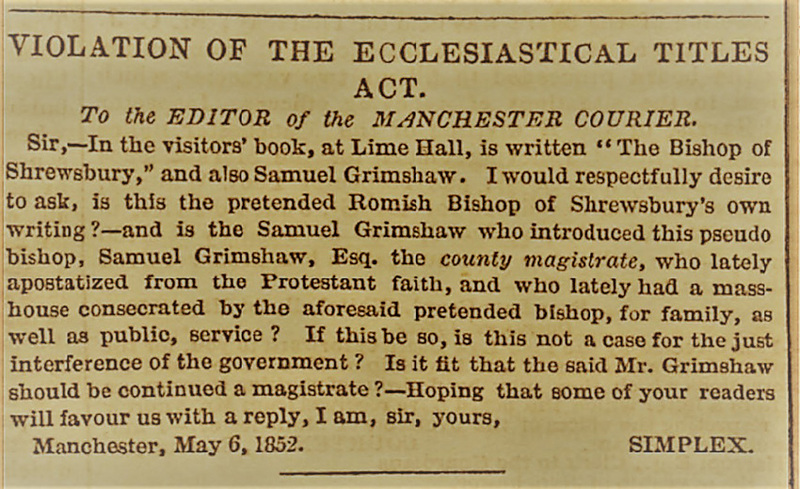 And is the Samual Grimshaw who introduced this pseudo bishop, Samual Grimshaw, Esq. the county magistrate, who lately apostatized from the Protestant faith, and who lately had a mass-house consecrated by the aforesaid pretended bishop, for family, as well as public, service? If this be so, is this not a case for the just interference of the government? Is it fit that the said Mr. Grimshaw should be continued a magistrate? Hoping that some of your readers will favour us with a reply, I am, sir, yours, Simplex. Samuel Grimshawe converted to Catholicism following the deaths of both his father and infant son in 1851. I think he must have waited until his father died before changing faith as the letter shows that there was still a great deal of prejudice against Roman Catholicism at this time, particularly within government and the establishment. Samuel had a room at the top of Errwood Hall consecrated as a Catholic chapel (above), and this seems to have prompted the anonymous letter-writer’s fierce condemnation. He particularly objected since Samuel was a local magistrate. But Samuel seems to have been unaffected by the criticism. In 1860 he donated £500 towards the cost of a new Catholic church in Stockport. And £100 to St Anne’s Church in Buxton. Later that year his 7-year-old daughter, Genevieve, laid the foundation stone at St Annes Church.